Kate is so happy when she found out that Hi-5 time at kids central has changed from 5pm to 12:30pm. Since she went to primary school, she couldn't watch this TV programme anymore as she comes home around 7pm. Now at least she could watch it once a week when her school starts late. 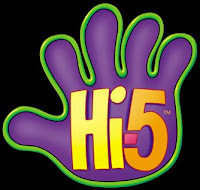 Until now, Kate's favourite is still Hi-5. She also likes to watch Bob the Builder, Winnie the Pooh, and Thomas the Tank Engine. She doesn't like to watch any kid's movie or programme that contains violance or has 'bad guy' character. This includes Barbie and Disney Princess' movie which most of girls like to watch. She would cry and getting upset when the 'good guy' is attacked by the 'bad guy', and doesn't want to continue watching it. But she is fine with action movie that Mum and Dad watch. She still enjoys playing with her Barbie dolls (7 Barbie, 1 Ken, and 2 Kelly) and reads story books about princess, though. But the movie... No, thank you.